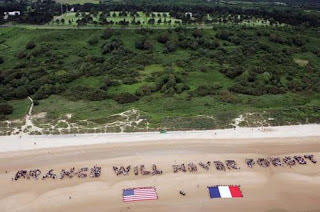 On the 4th of July this year (2007), 2,500 French people spelled out their thanks for the American Soldiers that gave their lives in Normandy. think about what Americans look like to the rest of the world. We can't really point fingers now, here, kids. hating those who hate our freedom. Below is an excerpt of a review of "It's Not Funny"
and it appeared in Stylus magazine. When he compares Bush’s appeal to American soldiers to pray for him to that of a king, he adds another layer of audacity to the truth. But when he adopts the character of a young soldier after an attack praying for the President, Cross reveals the hypocritical evil at the root of the conflict. It’s not funny, but it can’t help but be hilarious. He even offers some advice to those listeners suffering through the same media assault on our psyche. Whenever George Bush utters, “The terrorists hate our freedom”, simply summon imagery of The Simple Life’s “two rich, giggling cunts”. “You know what, I hate our freedom… that’s all we’ve done with it! ?” could be a mantra for anyone who craves not only 1st Amendment freedoms, but a deeper, psychic freedom. please click here to purchase "It's Not Funny".